blowitoutahere has no other items for sale. $1.50 shipping for each additional eligible item you buy from blowitoutahere, when you use the cart to make your purchase. Sales tax may apply when shipping to: AL*(4.0%), AZ*(5.6%), AR*(6.5%), CA*(8.0%), CO*(2.9%), CT*(6.35%), FL*(6.0%), GA*(7.0%), HI*(4.0%), ID*(6.0%), IL*(6.25%), IN*(5.0%), IA*, KS*(6.5%), KY*(6.0%), LA*(4.45%), ME*(5.5%), MA*(6.25%), MN*, MO*(4.225%), NE*(5.5%), NV*(6.85%), NJ*(6.625%), NM*(5.125%), NC*(6.75%), ND*(5.0%), OH*(5.75%), OK*(4.5%), PA*(6.0%), RI*(7.0%), SD*(4.5%), UT*(5.95%), VT*(6.0%), WA*, WV*(6.0%), WI*(5.0%), WY*(4.0%). Item as described, well packaged, fast shipping. Product received in excellent condition! Wonderful movies on a perfect DVD. No problems at all, with anything. Perfect!! Wonderful entertaining films! Need to take a lesson from the "old days"!!!! Great prints! Actually excellent to my opinion! Also I rather liked Helen Broderick's film! This is a great series, but the first three are the best; because as is usually the case, the original character that make it a hit are usually the best. Edna May Oliver is replaced by Helen Broderick; who is passable as not the original, but another (too me) Hildegarde, and her replacement seems out of place all together. The storyline is good and if it were not for James Gleason staying on, it wouldn't have been. I was disappointed with the changeover of Hildegarde's, Gleason looked the same. I think you get your money's worth on the first three though. THE BEST LADY DETECTIVE EVER! EXCELLENT COLLECTION OF A FEMALE SCHOOLMISTRESS/DETECTIVE. 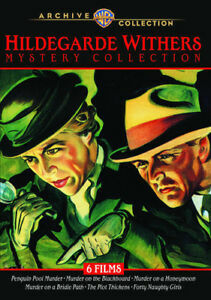 IF YOU LIKED MISS MARPLE THEN HILDEGARDE WITHERS IS EVEN BETTER. IF YOU BUY THIS YOU WILL NOT BE DISAPPOINTED.